With all the talk today about 1984, I thought this was a timely book to talk about. “Those who would give up Essential Liberty to purchase a little Temporary Safety, deserve neither Liberty nor Safety.” -Benjamin Franklin. Marcus Yallow and three of his friends skip out of school to participate in a game I don’t understand but that sounds so much like fun I tried googling it. In a horrible case of being in the wrong place at the wrong time they witness the San Francisco Bay Bridge being blown up, perhaps by terrorists. When the quartet tries to go to ground in a BART station the press of the crowd proves deadly and his friend Darryl is stabbed. Up on the street, trying to flag down help to get Darryl to a hospital, they are picked up as suspected terrorists by the Department of Homeland Security and taken to a secret prison where Marcus is tortured and interrogated. Days later he is allowed to go home but threatened with retribution if he is to reveal that he had been imprisoned and tortured. An accomplished hacker, he figures out a way to fight back. 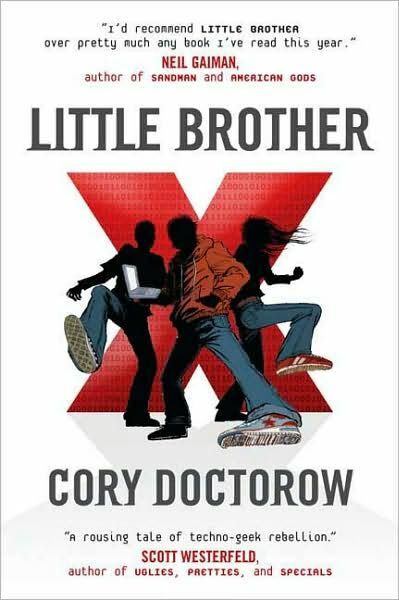 Full of heart and terrifyingly real, Doctorow’s first novel written specifically for teens is sure to be discussed and applauded by both teen and adult readers who realize the significance of the dystopian world that is evolving before us. It features interesting and scary parallels to Orwell’s 1984.